Agility(07) – What is the Core of Agile Methods? Agile methods give people a chance to do well. 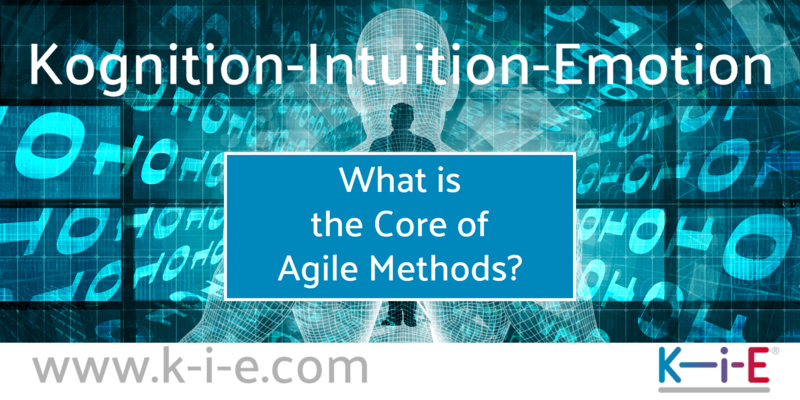 Agile methods are so successful because they are aligned to the inseparability of emotions, intuition and cognition. They thus correspond to the process of how people decide, feel, think and act. The question of what makes agile methods successful requires recognizing the core of agile methods. In the excited discussion about agile principles, attitudes, agile mindsets and agility, what constitutes agile methods is blurred. The view is further obscured by contributions from the advocates of classical project methods that enrich them with agile themes. They pick out metrics like velocity or the burndown chart. Or they integrate ceremonies such as daily stand up or retrospective. Furthermore, agile demands are formulated: there must be a mission with a supportive environment or teams must be equipped with competencies. The success of agile methods creates agile projects and agile project methods and project management in the meantime, which is a contradiction in terms. Of course, it is right and proper to enrich the classical project methods to compensate their weaknesses. But they do not become agile methods and projects remain projects, they do not become agile projects. In a project, the requirements are known at the beginning, from which a project plan with a sequential development process is derived. The project result with budget, schedule and necessary resources are known at the beginning of the project. Simply put, a traditional management receives a known scope of delivery at a known price. This is exactly what agile methods cannot and do not want. Corporate reality has shown that the classic project method is no longer sufficient because more than two thirds of projects fail to deliver on this promise. Roland Berger 2015: 90% of major projects exceed budget and schedule by more than 55%. Chaos Report Standish Group 2018: The long-term report for the years 1994 to 2015 showed only 29% successful projects, exactly the figure for 2015. The agile methods have developed to offer solutions for the moderate project success of classic project methods. What makes agile methods special? The belief in a perfect plan is replaced with agile methods like Scrum by quick feedback on the impact of decisions, changes and experiences. A compulsive final goal achievement is abandoned and replaced by a consistent continuous development and improvement. What is the core of agile methods? Agile methods like Scrum are an extremely disciplined approach to successfully implement projects. The core of any agile method is time-boxing and single-tasking in self-organized teams. Time-Boxing - Smallest possible units (stories) are processed in fixed time units (sprints) of one to four weeks. Time-Boxing turns classic project procedures upside down. Here, known functionalities are implemented in phases of varying length, a priori planned and then realized. Single-Tasking - means that team members can work on a topic as undisturbed as possible. Small self-organized teams - working together at eye level and combining the necessary competencies in the team (cross-functional teams). What makes agile methods so successful? Iterative approach is a consistent consequence of time-boxing, which as an obvious feature of agile methods is diametrically opposed to classical project methods. It allows you to react appropriately to changes and ensures success. This ensures that projects reach their goals and that the customer gets what he needs as a result. The iterative approach is a characteristic of the inseparability of emotions, intuition and cognition, which is why it corresponds to human thinking and behaviour. Read more about "What makes agile methods so successful" in the next blog. As explained above, the classic project approach is a contradiction to the agile methods. Conversely, the agile methods use the classic approach. Small self-organized teams work as cross-functional teams with the classic phases design, implementation, quality assurance, release and operations. The traditional methods have already recognized this success factor and want to integrate it with DevOps initiatives. Once the core of the agile methods with time-boxing, single-tasking and small self-organized tasks has been identified, they can be successfully introduced with decision-making processes, stabilized and their performance significantly improved. If the implicit decisions are integrated by decision processes explicitly aligned to the inseparability of emotions, intuition and cognition, the introduction of agile methods succeeds and consequently the performance increases from practical experience by a factor of 2. The fragile point of group dynamics, which is avoided through the work in small teams, can be solved solidly through decision-making processes. Decisions, quality, delegation and prioritization are then reliably produced in decision-making processes. They ensure that the participants develop the agile mindset when they experience how ceremonies succeed and artefacts are led to an appropriate quality. The integration of secure decision-making processes is the most important guarantor for agile methods to unfold their valuable potential. Agile methods thus achieve better results. This achieves agility that equips companies with the flexibility to act in the dynamics of today's globalized world and respond to disruptive changes. Agility(08) – Who makes agile change more difficult?